Heavy duty racing quality performance wire set. 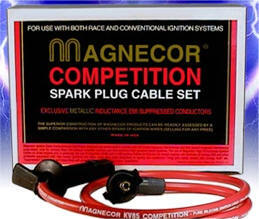 Magnecor is the undisputed master of the automotive ignition world, comprised of true craftsmen who instead of relying on glitz and creative (but misleading) marketing, create only the best and most effective spark plug wires for your vehicle, regardless of the cost, difficulty of manufacture, or amount of research and engineering involved. Magnecor KV85 and R-100 wires are specifically designed for (2003-06) Vipers and are unique in that their superior construction not only renders them practically indestructible under normal use while providing maximum output, but they also minimize electro magnetic and radio frequency interference, improving the life of your vehicle's electrical components. In a field of cheaply produced wires, and overpriced wires with unnecessary external cosmetic features, Magnecor produces wires that are best at the most important thing: results. We recommended Magnecor KV85 and R-100 wires for race cars and daily driven stock cars alike. Able to withstand 600-1,000 degrees Fahrenheit. Premium one piece heat resistant silicone outer cable construction dissipates heat. Unique Magnecor 2.5mm metallic inductance suppressed stainless steel conductor with ferromagnetic base core. Superior radio and electro magnetic interference reduction improves radio reception as well as life of vehicle electrical components. Used for street and track racing! Bosch Double Iridium Spark Plugs are engineered to deliver both high performance and long life, representing the best of OE spark plug technology. The ultra-fine wire design and laser welded tapered ground electrode deliver optimum performance, while the iridium center electrode and ground electrode help it to go the distance. 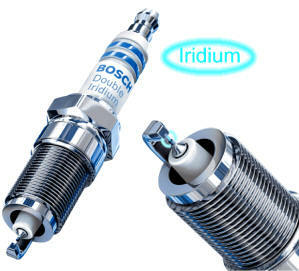 Unlock the performance in your engine with Bosch Double Iridium Spark Plugs. Set of 10 plugs per package. OEM Dodge factory part. Your Dodge RAM SRT10 V-10 engine require two coil packs. 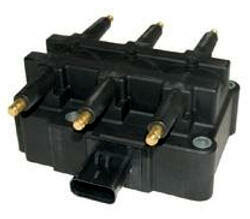 The 6SP controls 6 sparkplug wires and the 4SP controls 4 wires. O.E.M-type epoxy material in new-style epoxy units for superior dielectric strength. 100% copper wire in both primary and secondary windings for proven performance. Units' thermal shock tested from -40 to 250 degrees. Units' endurance tested operating at 250 degrees for up to 1,000 hours. Primary and Secondary windings with enamel magnet wire rating highest temperature available in the aftermarket. OEM coil packs are very limited, the spark tends to weaken around the 3500 rpm range, Upgrade today to Performance coils and keep spark strong to 6000 RPMS and gain approximately 5 RWHP, and at the same time upping your mileage about a half mile per gallon, combine these with our performance wires and performance spark plugs and regain and enhance the performance of your Viper Truck. This is a universal device enables you to have a push button start. It is hooked up to your 12V power source. This button is illuminated by LED light when it is on. 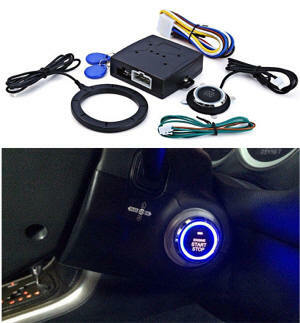 Fits all cars with 12 volt system. This is a simple and easy use RFID Car Alarm with Finger Engine Start Push Button Start Stop and Transponder Immobilizer. RFID Car Engine Push Starter is easy to install and use, can start or stop your car much easier and keep your car safe at the same time. 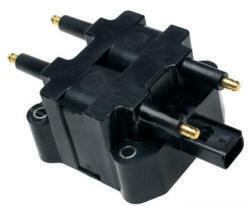 This item is only work with DC12V cars at the moment. ● Push button engine start. ● Automatically lock the host after stalling 35 seconds. ● 10 minutes timing flameout function after telecontrol starting. ● Telecontrol starting safe handbrake detection function. ● Automatic locking the door function after telecontrol starting. ● Open acoustics and dashboard function. ● Immobilizer, with warded lock card anti-theft function, the system will enter arming mode after 15 seconds automatically when car is stopped. ● In arming mode, when the responder gets close to (about 2 - 5cm) the wire circle, the system will sound Bi Bi, which indicates the system is disarm. ● Can be matched your car alarm system or keyless entry system. ● Easy to install and to detach.